Good morning. I have been seeking info on bolt actions as of late. Have owned several, Savage, mil surplus mausers, push feed Model 70 and am hoping to get opinions on the New production model 70's with the traditional controlled Rd feed Mauser type action. Prices seem good..much less it seems than Kimber and other Mauser types being offered. Are these actually made in the USA ? Quality? Any info is good..thanks!! Country of manufacturer is inscribed on barrel. No clue on quality of such lately, my last sota M 70 was one of the last produced in New Haven and marked FN PBR. It's a keeper! Last edited by MAINER; June 09, 2018 at 13:48. I went to FN's website, looks like they don't make the PBR any longer--was a great idea of a rifle. I just don't like det. mags in bolt actions. Mags are often extra-ordinarly expensive, hard to find, easy to lose. I noticed all the Model 70's offered on Winchesters website have the detachable floor plate. That's too bad because, as it turns out, I am not real fond of DBMs either. I'm OK with the one I have, but don't want another. It has the advantage of being easily loaded or unloaded, handy if you live in a state like mine that doesn't permit loaded guns in vehicles. Someone mentioned keeping a backup Mag loaded with alterative loads, not sure that appeals to me, but others might think it a plus. The DBM has the disadvantage of not being able to top-off the magazine and if you drop it in the lake or over the canyon rim, you got a single shot rifle. Reloading limits the OAL to fit inside the mag. whereas the standard magazine generally allows bullets seated closer to the lands and better accuracy. I found spare DBM mags on sale at CDNN and they were still $40 for a five shot mag. The used gun rack seems to be the best hope for a moderately priced Mauser type rifle these days. They even screwed the CZ 550 over now it seems. I had a 550 in .243--wish I still had it. Now they have a bunch of pushfeeders, the 557. Ugh! I think the only 550 they make is the Mannlicher in .30-06. Beautiful rifle. May get on--had iron sights and their cool built in to the receiver scope mount. My 550 is the FS model or yup "Mannlicher". Always wanted one of those things, likely influenced by all the old Jungle Jim and other African movies I watched as a kid. My rifle is in 6.5X55 Mauser caliber that I am growing ever fonder of. The only gripe I had about it was the plastic floor plate that came on it. I got a steel version from CZ and now I'm happy. The set trigger on those 550's is just about as "cool" as it can get. Great fun, but tends to empty ammo boxes rapidly. btw; My 550 didn't come with rings and I quickly found those things are what I call "pricey". I couldn't find CZ rings, think mine are from Warne. Finally took a look at Winchesters website and now I guess I don't know what you are looking for. Seems to be plenty of classic Mauser or old Model 70 type stuff on current models. No Detachable Box mag and has a pre-64 Mauser extractor. Very nice rifle I think and I am a dyed in the wool Mauser (Win Pre-64) fan. It even comes in my beloved caliber of 30-06. Yeah, I am bummed. Hard for me to believe they would drop the 550, rats! Guess I will be checking the used rifle racks for stray Mausers more frequently. This one from Ruger has caught my interest, already have the reloading set up. Of course I have missed the .275 Rigby, but the 6.5 X 55 is still on the market. 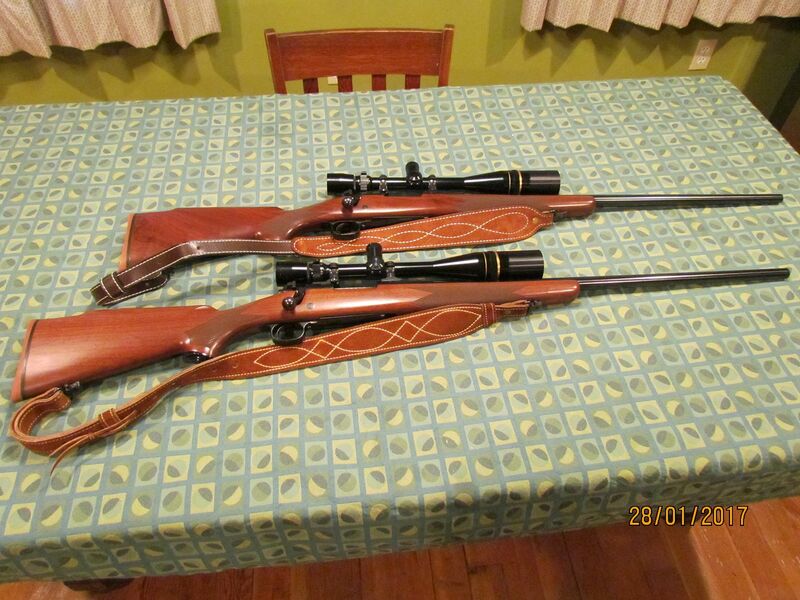 Lipseys also has Ruger 77's in Mannlicher style called the "International"
I see a lot of 550's on gunbroker. Prices are pretty good. Saw some NIB full stock 550's for under a grand. Yeah, so long as the gun don't turn out to be a "turkey". Heisser Mann, thanks, been looking at them sort of causually, really do not NEED another Bolt gun, but if the right one comes along and winks at me, who knows? Just yesterday, there was a really nice Kimber 84 in 308 that said she could be had for $750. Hmmm. I have a PSS or SPS (not sure which). 26 inch heavy barrel with a nice Burris on it. It shoots a tight little 3 shot clover leaf at 100 yds. And that's with Aussie mil surp 7.62 ammo. I think I could get one ragged hole with match grade ammo. It's one of the best shooting rifles I own. When you get groups that tight, you can sleep better ,right? I had similar results with the Greek surplus 30-06 ten yrs or so ago with my Garands. I think the smallest group measured .619 inches at 100yds, open sights, about 20 degrees outside in the dead of winter. MAINER, A very good friend of mine and Mentor that just passed away 3 months ago developed the Kimber 84 series of Bolt actions. His Name was Nehamia Sirkis. Lee, sorry to hear of your friend's passing. He must certainly have been an interesting man to know. I'm sure you are aware that those Kimber's were some mighty fine rifles. I at first thought that .308 Kimber I looked at in the LGS was a custom built rifle and a good one at that. I have had this pair of model 70s for about 40 years. Top is .223 and bottom .308 both with Leupold 6.5 - 20 scopes with target dots.